Friday mornings are some of the absolute best times during the entire week. I typically wake up and brew a large pot of delicious dark roast coffee.. sit with Brody ..and enjoy a blueberry muffin. This glorious time ends up lasting for a approximately 20 minutes before it's time to get ready and head on to my nanny world. However, what makes Fridays a bit more inviting from the other weekdays, is that I only have work until around 1pm followed by few errands to run. This has been allowing me ample time to enjoy the rest of the day leisurely (and I must say... starts the weekend off just right). For some reason this past week has felt especially long and tiring.. and I have found it hard to hide those reoccurring irritable mood swings (mostly due to things not going as I had hoped or planned for the day). Luckily, this is when super long walks uphill (pushing a stroller with 2 infants) is beneficial in getting all those emotions out of my system or just a good run at the end of the day. Let's face it..fresh air helps everyone..it's a fact I'm most sure of. My weeks, these days, are never filled solely with nannying ..but this past was a doosey between emailing/marketing/writing/nannying. So as I sit here, while sweet baby Elizabeth (who is almost 11 months) is napping, I am looking forward to a baby free weekend, seeing my mom and enjoying the warm Charlotte weather. In the meantime..here are a few photos (from my phone) of Elizabeth and her "BlaBla" doll. 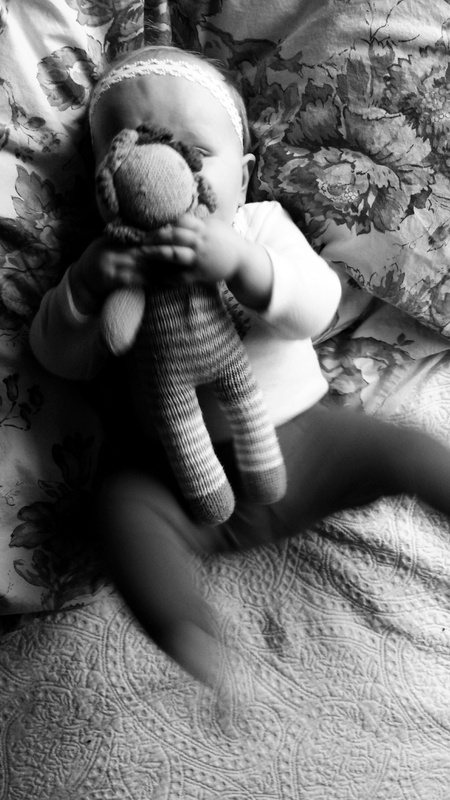 We had a very playful morning as she is more precocious nowadays. I am pursuing more documentary photography (on the side) and transparently showing the reality of life. Enjoy!